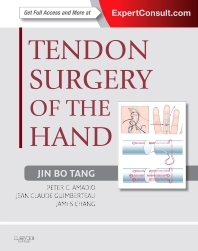 Get the best results from the latest procedures with Tendon Surgery of the Hand, the only reference that offers comprehensive coverage of this complex and challenging area. World-renowned experts guide you through all of the newest techniques and technologies, equipping you to restore optimal function in your patients. It's your one-stop source for mastering today's best approaches to treating tendon injuries and disorders of the hand. Successfully implement hot new repair techniques involving new suture materials, tendon sheath and pulley treatments, vascularized tendon grafts, and recent postoperative rehabilitation methods. Improve your primary flexor tendon repair and rehabilitation treatment planning based on surgical and post-surgical care principles that clearly describe successful global methods and protocols. Benefit from the collective knowledge and experience of an international group of surgeons, investigators, and therapists who offer unique and insightful techniques and advice. See how to perform key techniques with exclusive operative videos online.